The pick-up point is on H.C. Andersens Boulevard 26. We will drop you off anywhere in the inner city of Copenhagen. Hop aboard your tour minibus and set off on your exploration of the inner city of Copenhagen. 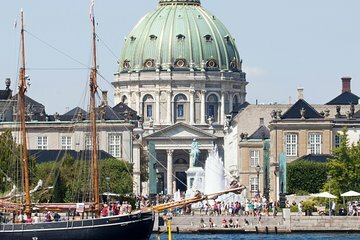 On a 1-hour canal tour, go cruising around the city’s charming waterways, and then head to Christiansborg Palace (the Danish parliament), where you’ll visit the reception rooms used by Danish royalty. See Amalienborg Palace Square, one of the city’s most beautiful squares and home to the royal family, and visit Rosenborg Castle, a Renaissance palace where the Danish crown jewels are kept, as well as paintings and other treasures. Other landmarks and sights you’ll see include the Opera House, Nyhavn (New Harbour), Vesterbro, Christianshavn, the Old Stock Exchange, Kongens Nytorv (King’s Square), lakes and The Little Mermaid statue. Excellent trip of inner Copenhagen and some of the castles. Rasmus was an excellent host.